The 30-year-old Indian took all 10 rounds to systematically dismantle the 34-year-old Welsh-born Australian and record his seventh straight win in the circuit, a year after turning professional. 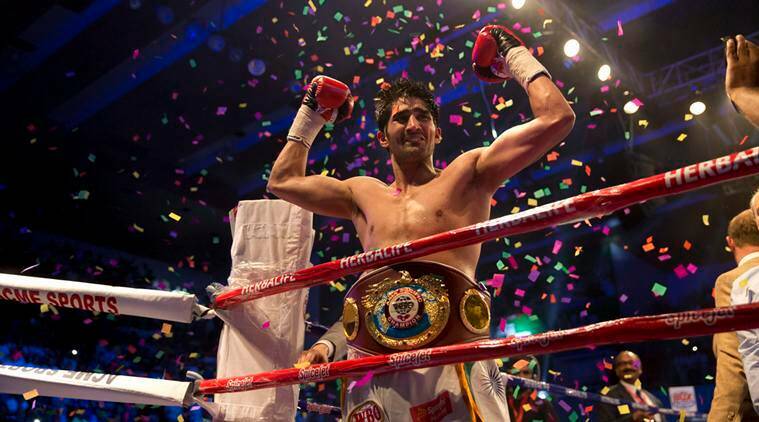 Tonight was also the longest that Vijender spent inside the ring to clinch a win since turning pro besides being his first points win after six knockouts. The six-footer from Haryana scored 98-92, 98-92, 100-90 to be the unanimous winner. To his credit, Hope tried his best early on but just could not find a way to breach Vijender's defence, hampered to an extent by his shorter arms. The moment the final bell was sounded, Vijender's British trainer Lee Beard lifted him up to celebrate even before the decision had been announced, sending the crowd into a frenzy. The eight-round contest ended unanimously in Verma's favour. In the heavy weight division, Haryana's Sumit Rangi got the better of debutant Naveen Rao from Delhi in a six round contest. In the light-heavy category, Gaganpreet Sharma from Chandigarh prevailed over Deepak Sheoran in another six-rounder. Pegthong was thrown off-balance by a stinging right jab and could not recover from the blow, giving Sunil a knockout triumph in his very first bout. Before the Vijender-Hope face-off, there was another India-Australia clash when the undefeated Cameron Hammond took on Devdarshan in a welterweight six-round bout. The Indian fought hard but still fell short as Hammond, who had participated in the 2010 Commonwealth Games here, scored a unanimous victory. But in a fine sporting gesture, Hammond raised his rival's hand after the results were declared to acknowledge the local favourite's fine effort.